Minimalist. Clean and Serene. When you prefer things just as they are. 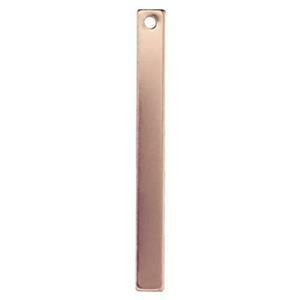 Our 14/20 Double Clad Rose Gold Filled GFR2578 24 Gauge Bar Drop. Use it as a pendant or an earring dangle. This one has a single 1.1mm Inside Diameter Hole which will accommodate an 18 Gauge or thinner Jump Ring. Create a Clean and Serene Look by dangling a Single Drop from one of our Finished Rose Gold-Filled Neck Chains.